To understand this quote, it is important to know a little about the speaker. 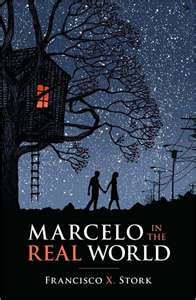 Marcelo in the Real World is a story about a teenage boy, with Asperger’s trying to fit into the ‘real world’ or at least the world society has deemed real and normal. I think at one time, most people have felt something similiar to this quote. As if you are alone and unable to relate or connect with anyone else. Or possibly, you feel as if no one can relate to you and what you feel. It is difficult to feel as if no one understands what you feel and it is probably impossible to always understand how others feel, which can often be just as frustrating. For anyone who has known someone with Asperger’s, Austism, other special needs, or even for someone who has felt as if they didn’t always fit into the ‘mold’ I recommend checking this book out.